Hunting is a great way for you and your pony to go cross country, forming a partnership, improving your riding and meeting like-minded people of all ages. 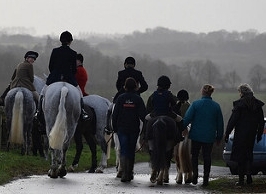 The Cotswold Hunt and the Cotswold Hunt Pony Club are very closely related, helping each other out at each other’s events. We are keen to encourage our members to go out hunting if they would like to, and there are Children’s Meets several times a year, in the autumn and spring half terms and in the Christmas Holidays. At the end of the summer holidays, we jointly hold a Walk/Trot Hunt Rally which gives young members and newcomers to hunting a flavour of what it is about, and a chance to meet Hunt members, ask lots of questions, introduce ponies to hounds and to learn the rules and etiquette of hunting while riding cross country as well as seeing hounds up close. There are also various opportunities to go on hound exercise and kennel visits during the summer. These opportunities are suitable for all abilities including lead rein, but please take the time to read the notes below for more information and for further information please look on the main Pony Club and Cotswold Hunt websites. In 2018 we are also holding a two day Hunting Camp in June. This is a great opportunity to learn more about Hunting in depth as well as have a lot of fun! If you are thinking of hunting for the first time, or would like to find out where a particular Meet is, contact the CHPC Hunting Rep – Sophie de Rouet – 07887 680142. Children 5 and under should be on a lead rein. 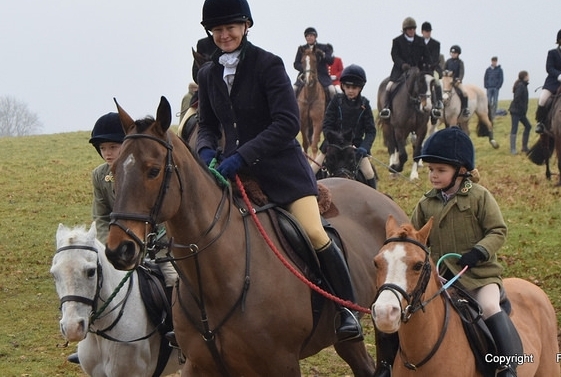 Children aged 6 to 13 will be assessed by either Masters of the Cotswold Hunt or qualified riding instructors. The level of supervision required whilst trail hunting within this category will be determined by the Masters and conveyed to the parent or guardian of the child concerned. For children aged 11 to 13 who have passed the Pony Club C test, or hold the Pony Club Hunting Certificate, no assessment will be required. The Masters will in any event keep the supervision requirements for this group under review. Children aged 14-17 may ride unsupervised, provided that they hold the Pony Club C Test, or an equivalent qualification, or have demonstrated their competence by previous experience. If you are sending your child out unaccompanied please ensure that there is a responsible adult able to keep an eye on them (this should be arranged in advance, not at the meet! ), and please follow on foot so that you are on hand in case of problems. Neither the Hunt nor its individual member can accept any liability or responsibility for any accident or incident to any supporter or follower of the Hunt. 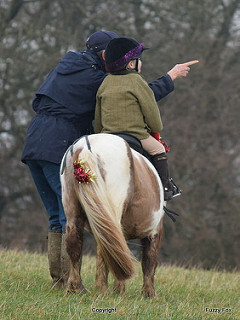 Children must be competent in all paces, and if they are not able to jump hunt fences it is important that they are accompanied by someone able to look after them so that they aren’t separated from the rest of the field. Please ensure that all children find a Master at the meet to say “Good Morning” and also so that the Masters are aware of the children that are out on the day. All children must have a piece of paper (ideally laminated) in their pocket with at least one emergency contact number on – it is not sufficient for them to just be carrying a phone, in case the battery is flat or the phone is locked, lost or waterlogged when the contact number is needed. They should also have a piece of baler twine (to use as an emergency lead rope/rein/stirrup leather). A sugary snack or chocolate bar is strongly recommended. Tweed jacket (hunting coat for older members), shirt and Pony Club tie (stock for older members), long boots or boots and half chaps, plain dark hat silk, warm gloves. Body protectors are mandatory for all members under 18 and are a great way to keep warm. If you don’t have a tweed jacket or if the weather is very wet, a Barbour or other plain dark riding jacket is acceptable. All members must wear a hat in line with the Pony Club’s own rules for riding cross country (ie one tagged with the current turquoise tag). There is guidance on safe clothing for all members and visitors on the Cotswold Hunt website. Ponies should be clean and tidy, and plaited from 1st November. If your pony might kick please ensure it wears a red ribbon and stay towards the back of the field. 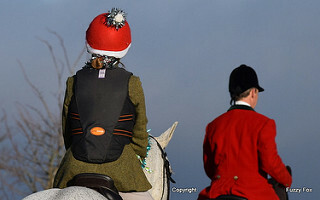 The cap can be paid by cash or cheque (payable to Cotswold Hunt), and should be paid as soon as you arrive at the meet. Please find the secretary as soon as you arrive – they will usually have a small leather satchel on – please don’t leave it for them to come and find you! One practical session at either the kennels or another suitable place – to include opening and shutting gates and hunting conduct. Please contact Sophie de Rouet on 07887 680142, sophie.derouet@googlemail.com, if you are interested. All current members of the Pony Club are covered by Pony Club Insurance whilst participating in any legal form of hunting. The Cotswold Hunt requests that all followers are members of the Countryside Alliance (membership is £24 for under 25s).